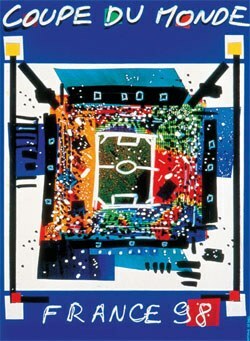 The 16th World Cup was played in France States from 10 June to 12 July. The World Cup had expanded from the previous 24 teams to 32. The main reason was that the amount of involved nations in the qualification stages had increased to 174 nations, 27 more than in the previous World Cup. After being blacklisted under a long period for the apartheid, South Africa made their first appearance in FIFA World Cup. Yugoslavia had been banned from several competitions due to the Balkan War, now they were back and also Croatia for the first time since their independence. The same was true for Jamaica, that for the first time had qualified for the final tournament. The increased amount of teams resulting in that the number of groups was increased from six to eight. Two teams from every group would advance to the knock-out phase. Golden Goal was introduced which meant a goal in extra time would end the match. The motivation behind the rule was to give more reasons for playing offensive in extra time and by that decrease the numbers of matches decided on penalty shoot-out – the rule did however not succeed with this. The matches would be played in ten cities and the same amount of stadiums (see “Cities and stadiums” box for overview). The biggest stadium where the final was played was Stade de France in Saint-Denis (near Paris) which had a capacity of 80,000. One of the matches in Group F was special due to the political conflicts that had surrounded the two nations, United States and Iran. United States was seen as "the big Satan" in Iran, but when the nations met at the football field mutual respect were given. Fraternization between football player from United States and Iran. The home team France would hold up to the pressure and could finally win the tournament, but not without difficulties. The star Zinedine Zidane would get a red card after a stupid kick against a player. France would still win the group and Zidane would return to the team after one match suspension. In the Round of 16, France needed extra time to score a goal against Paraguay, and they were forced to gamble against Italy in the next game with a penalty-shootout. 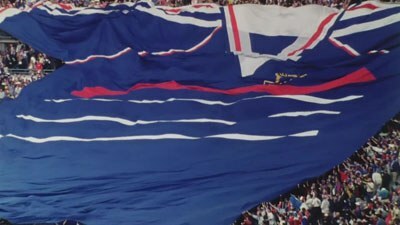 The home teams shirt in giant size. The German team included many older players, and they would be crushed by Croatia in the Quarter-finals. Argentina was going for their third title and had a dribbler in the Maradona-like Ortega – Ortega would, however lose his temper (as Maradona in 1982) and was sent off after head-butting the Holland goalkeeper Edwin van der Sar. The Dutch team showed the rest of the world an unpleasant discord based on the contradiction between black and white players. The team would, nevertheless, perform at a high level and was very close to reach the final. Until the final many though that Ronaldo's brilliance would serve Brazil another World Cup title in similar fashion as Romario’s brilliance had done four years earlier. His appearance in the final was, however, only a shadow of himself, and the rest of the Brazilian team was seemingly affected by Ronaldo's poor condition. Already before the match something strange seemed to be going on: the Brazilian team didn't go out to the warm up. Afterwards, many rumors said different things. What actually had happened was that Ronaldo had collapsed before the game, but if it was a nervous breakdown, an epileptic seizure or something else have remained unanswered. France score in the final against Brazil. FIFA World Cup 1998 would include 64 matches in which 171 goals were made (2,67 goals per match). 18 red cards was shown in the tournament (a record, but the expansion of teams had also led to more playing minutes). The 250 yellow cards was a new record as well. France would beat Brazil in the final with 3-0, the biggest goal difference in a World Cup final since 1958. The French squad celebrates after the final victory.